The client had operations in over 10 different countries all over the world and was expanding fast in the last couple of years. It was significant that in just one year its personnel increased by 40%, causing many problems in the whole recruitment, selection, hiring and on-boarding processes. On the other hand, the client faced inconsistencies in the way sales and projects were managed in different departments of different countries. A People and Project Management platform as a central point to control information in role-based access has been one of the pillars of the client’s corporate strategic objective. Personnel data, absence management, booking requests, time management, 2 or 3-step level approval of time and expenses tracked in Projects, people and project dashboards with KPIs and reporting are some of the key features of the final deliverable. One of the basic problems was that processes had to comply with multiple countries with different legislation. Implementation of features that comply with different countries’ working environment was easy using Comidor’s agile development low-code platform. To integrate with the client’s ERP and CRM system different approaches were used: REST and SOAP web services, direct connection to other databases (SQLServer, MySQL), importing data from CSV files. The results were a unified system through which all processes can be managed, from project initiation with invoicing plan setup and resource budgeting till actual project monitoring with risk management, project, and people dashboards give real-time information that focuses on people skills, efficiency, and effectiveness. 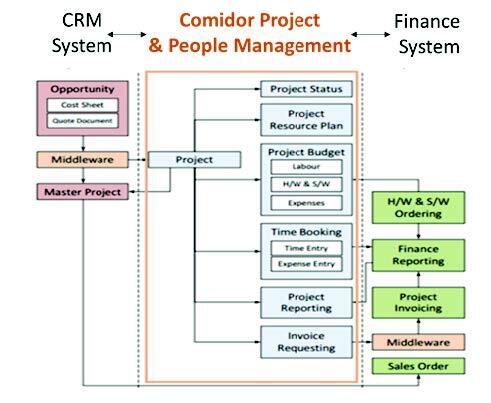 Comidor was seamlessly integrated with the CRM system, reducing licensing costs up to 50%.